This fall I saw these glasses at a garage sale. I had no idea what they were, but I just had a feeling…they were heavy, gold and no fading. The glasses had to be something special. Finally got around to researching them. 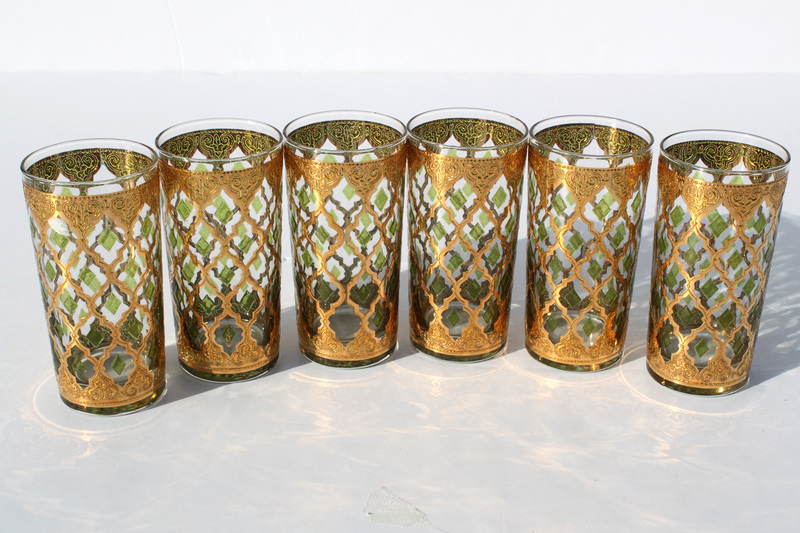 They are Culver 22K gold high ball glasses in the Green Diamond Valencia pattern. They are selling well online. I got mine listed the other day. I think they would be beautiful on a formal Christmas table. We will see if they sell. I sometimes doubt my “gut”. Most of the time when I go with a gut feeling, it usually pays off. Not always, but I think I am going to go with it from now on. I don’t have a smartphone, so can’t look things up while I am out and about. Sometimes it just wouldn’t be possible even if I had one. I just think that I have been doing this for almost 2 years now. I have been learning, and I should just go with my intuition. So do you go with your intuition? Yes, they have been sold.